A French citizen charged with “terrorist murder” for the slayings of four people at a Jewish museum in Belgium refused to testify at his trial Tuesday, saying he didn’t commit the killings but the court had barred witnesses who could have spoken on his behalf. Asked whether he killed the four victims, Nemmouche answered “No.” He did acknowledge transporting the guns that investigators said were used in the museum slayings. Security camera video of the attack showed a gunman wearing a baseball cap shooting the Israeli couple at point blank range at the museum’s entrance. The shooter then walked down a corridor and fired into offices. When his handgun jammed, he pulled out an assault rifle and sprayed the offices, which is where the two workers were killed. The whole attack unfolded over 82 seconds and the killer strode away. Nemmouche later was captured in France while traveling on a bus to Marseille. He had the guns allegedly used in the museum killings with him. His lawyers claim he was forced to transport the weapons, but gave no details. An alleged accomplice, Nacer Bendrer, 30, also appeared in court Tuesday. Prosecutors accuse Bendrer of supplying the guns to Nemmouche. 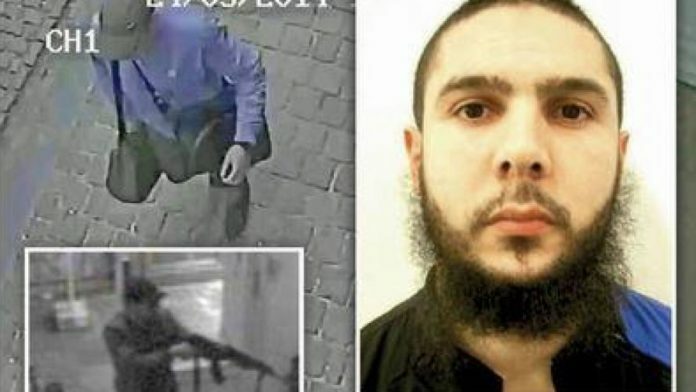 French authorities have alleged Nemmouche was one of the jihadists who kept four French journalists hostage until they were freed in April 2014 in Syria. Defense lawyers claimed Tuesday the museum shootings were the work of Mossad agents who targeted the Israeli couple. “The killing was not an attack by Islamic State, but a targeted execution by agents from Mossad,” said lawyer Virginie Taelman, adding that details explaining why would be provided later. Defense lawyers asked Mossad officials to testify at the trial but their request was rejected. The defense urged the 12-person jury to acquit Nemmouche, saying none of his DNA was found at the scene or on the trigger of the revolver even though the killer did not wear gloves. “Traces of DNA would have to be found on the handle and on the door” to the offices the gunman tried to open at one point, defense lawyer Henri Laquay said. Nemmouche’s DNA was found on the barrel of the handgun and on the assault rifle but his lawyers said it was from his handling the weapons in a bag he was carrying to Marseille. They also asserted that at least one security image of the attack had been manipulated.